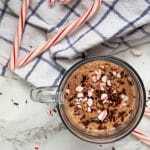 Peppermint hot chocolate is the ultimate cozy winter drink, made dairy-free in this easy recipe! Homemade hot chocolate has never been easier! All of my vegan and dairy-free friends: rejoice! 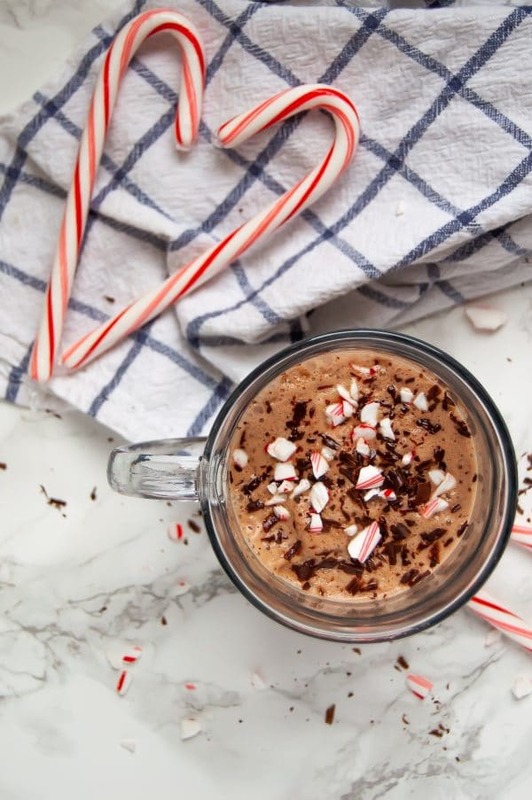 A festive peppermint hot chocolate that is dairy-free and vegan and ready for you to enjoy! And per usual around here, I have some further suggestions for customizing this cozy drink to make it a perfect fit for your tastes and your lifestyle. While you can make this cocoa on the stove top, this busy mom’s tried-and-true method uses the microwave. Of course, the microwave makes this drink come together in just a couple minutes. But for whatever reason, I also find that my taste buds can’t detect any weird alcohol aftertaste from the peppermint extract when I heat it with the “milk” together in the microwave, as opposed to on the stove-top. You can leave as is or garnish with some whipped cream or coconut whip, peppermint and chocolate shavings, a candy cane, etc. 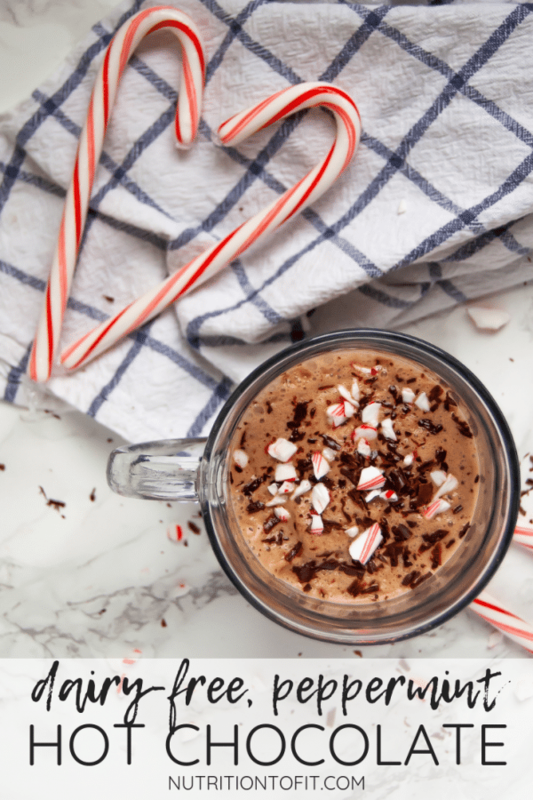 There are also some variations to help you customize this peppermint hot chocolate to be exactly what you’re looking for. Try taking out a tablespoon or two of almond milk (or whichever milk!) and substituting one or two tablespoons of full fat, creamy coconut milk from a can (or other shelf-stable package). This type of coconut milk is ultra creamy and decadent. 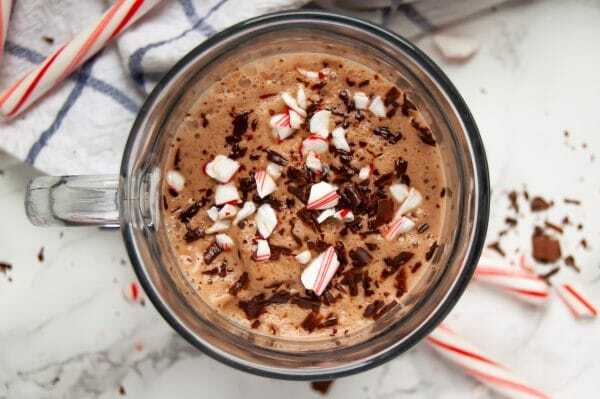 It definitely helps give this peppermint hot chocolate a richer mouthfeel! If you’re allergic to nuts or can’t tolerate almonds/ almond milk in any way, feel free to use any type of unsweetened, plain milk alternative you prefer. Ideas? Rice milk, hemp milk, oat milk, soy milk, etc. Find what you enjoy the most and helps your body feel your best! Want more healthier, cozy beverages? 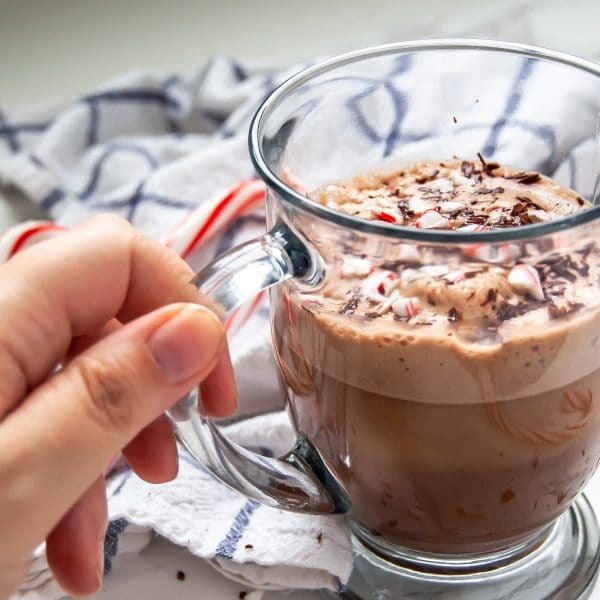 When you make this dairy-free peppermint hot chocolate, take a picture and share it to social media (tag @nutritiontofit and #nutritiontofit). Enjoy, and live well! optional garnish: crushed peppermint, chocolate shavings, whipped cream or coconut whip, candy canes, etc. In a small microwave-safe container, combine almond milk and peppermint extract. Heat on high for 2 minutes. Serve with any optional garnishes (if desired) and enjoy! To make nut-free, use a nut-free milk substitute (i.e. soy milk, hemp milk, ice milk). To make ultra creamy, take out 1-2 tbsp almond milk and add 1-2 tbsp canned coconut milk. To add a protein boost, add 1 scoop unflavored collagen peptides prior to mixing. I usually make my cocoa with regular milk but it was so creamy and yummy with the almond milk!! Thank you! Hot Chocolate is my favorite seasonal drink! I will be adding peppermint now!! This was such a nice twist on traditional hot chocolate! I’m glad you enjoyed, thank you! 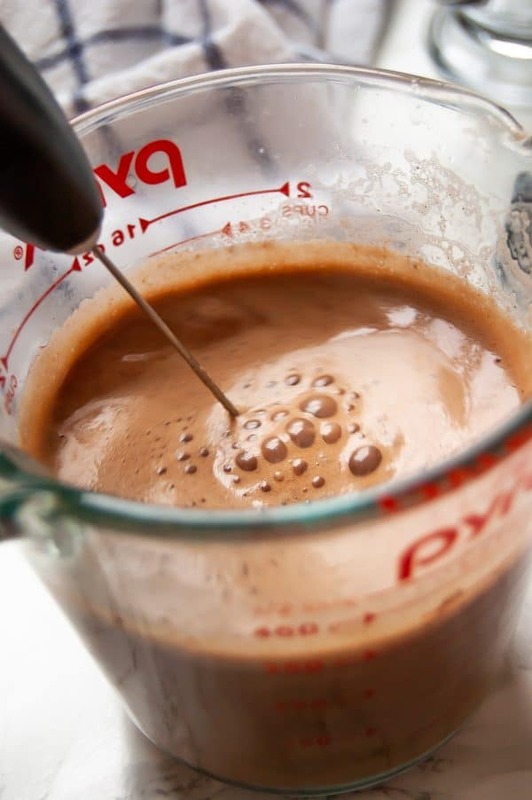 Never thought about adding collagen to my hot chocolate. I’ll have to try it this week along with peppermint! It’s been my favorite way lately to enjoy a more balanced/ blood sugar regulating drink! A milk frother is on my wish list this holiday. But this was still amazing in the blender! I just have a cheap $2.99 one from IKEA and seriously use it every single day! Almond milk is quickly becoming my new fav! Same here! I go through stages and switch things up from time-to-time, but I’m definitely currently on an almond milk kick! Wow, This looks yummy. And love your step by step instruction to make this at home. I will try it for sure. Thanks for the sharing this yummy recipe with all of us.